Ann Mary O’Brien was born in New York City on August 27, 1923, one of nine children of Margaret Rafferty and Thomas O’Brien who had immigrated to the United States from Ireland. No doubt growing up in a large family prepared her for life in community; exposure to the multicultural mix of New York City gave her an awareness of the wider world, and the strong Catholic identity of the Irish-American immigrants fostered in her the call to be a Marist Missionary Sister. Anne entered the Marist Missionary Sisters in Massachusetts in February 1946, and later took the name of Sr Mary Carol. She made her first vows on August 15th 1948, and some months later began to prepare for a teaching career at St Joseph’s College in Portland, Maine. She left for Samoa on Christmas Eve, 1950, and began teaching at Savalalo a month later. Over the years she taught at many of the mission schools in both Samoa and American Samoa, and was often called upon to be local superior. In the 1970’s she also cared for the senior sisters in Moamoa, Leone, and Falefa, and served as a Regional Councilor. Sr. M Carol returned to the USA briefly in 1964 for her Second Novitiate, and then finally in 1981. She was soon asked to be coordinator in the Winchester community and later gave community service in Lexington (which was then our hospitality house for Sisters visiting or in transition from overseas missions). She was very happy to participate in a longer spiritual renewal program in Dover, Massachusetts from September ’84 to April ’85. In September 1985, she set out for a new mission in a rural area of southern Georgia, USA. Told that she would need to drive a car for this new mission, she was determined to learn and got her driver’s license. She was happy that there were few cars and fewer stoplights on those dusty roads. She and Sr. M Stephen happily served 4 Catholic parishes in the area around Valdosta, teaching religion, visiting the sick and doing much of the pastoral care. 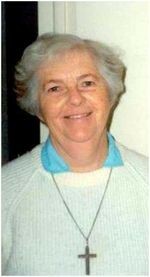 In 1993 when our mission in Georgia was closed, Sr. M Carol returned to Massachusetts and during the next few years alternated between giving service in Waltham and going down to New Jersey to help two of her sisters who were very ill. She was one of a group who went to live at St Mary’s Apartments in Waltham in 2001, but returned to the large community at 62 Newton Street in 2005, when she began to be ill.
For as long as she could, with the help of Sr. Sylvia, she continued to go out to people in need of a visit – whether at Maristhill Nursing Home or in the wider community. She was finally admitted to Maristhill herself in February 2010, and died there peacefully on the morning on March 29, 2011. A number of family members, including her sister-in-law and several nephews and their families, attended the wake and funeral, which was held on April 4th at Newton Street. “The Cross and suffering were close companions to Sr. M Carol, especially the past few years when her memory began to fail her. We cannot begin to know how frightening such a realization is. She maintained her smile and wit and carried her cross. Her ‘Simon of Cyrene’ was Sr M Sylvia who walked at her side. You removed my suffering and girded me with joy. All of us who knew Sr Mary Carol, are grateful for her gentle and joyful presence in our lives, and are confident that she is now experiencing the fullness of happiness in the loving welcome of Jesus and Mary and all her loved ones who went before her. May she rest in peace.